Go ahead and take the biggest slice on the plate because every morning is better when it starts with this easy Chocolate Chip Coffee Cake recipe! Weekend brunches are one of our favorite meals, and they can also be one of the easiest to host. 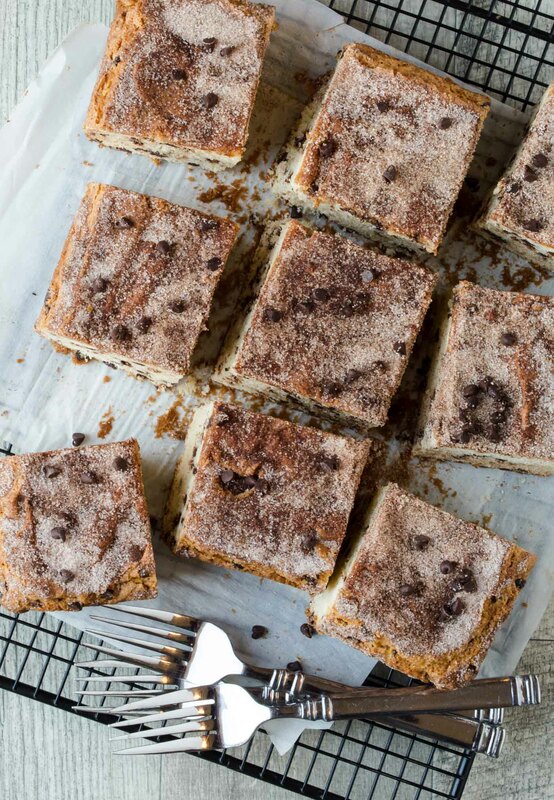 Freshly baked goods are hard to turn down, and you can never go wrong with coffee cake. Add this Chocolate Chip Coffee Cake Recipe to your next brunch menu, and you are well on your way to a successful brunch. Everyone loves a good coffee cake. Especially one that is filled with chocolate chips and topped with cinnamon sugar. But no one likes a coffee cake that is dry or undercooked. Start with fresh ingredients. Make sure that your baking soda, baking powder and flour are fresh. Add the date when each item is purchased to the container so you can keep track. If it’s been open for 6 months, it’s best to toss it, even if the expiration date says otherwise. Don’t over beat the batter. Adding too much air to the batter will create air pockets that will cause your coffee cake to crater in the middle. Beat just enough to achieve smoothness in the batter. Don’t underbake it. Use a toothpick or cake tester to ensure that the coffee cake is baked all the way through. If it isn’t, you’ll end up with a cake that is done on the edges and slumps in the middle after it cools because it isn’t fully baked in the middle. Hosting brunch is a great way to start a weekend. 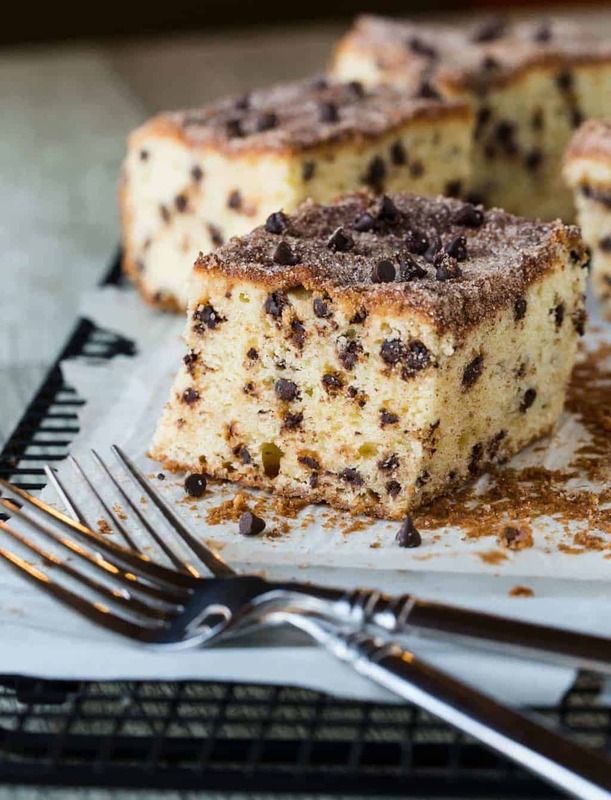 In addition to this Chocolate Chip Coffee Cake, round out your menu with a Ginger Grapefruit Sparkler, a mouth-watering frittata and a fresh green salad, and you have all of your bases covered. No one needs to know how easy it was to pull together. Brunch entertaining made easy. Mission accomplished. Preheat oven to 350 degrees. Line a 8 x 8 baking pan with parchment paper and set aside. Combine cinnamon and sugar for topping in a small bowl and set aside. In a medium bowl cream butter, cream cheese and sugar together until smooth. Being careful to not over mix. Add vanilla and the eggs one at a time and mix until incorporated after each addition. In a small bowl add the flour, baking powder, baking soda and salt. Add the flour mixture to the creamed mixture in three parts, alternating with the milk. Be sure to mix until flour is just combined. Do not over mix. Stir in chocolate chips. Spread batter in prepared pan (batter will be thick). Evenly sprinkle with cinnamon sugar mixture and bake for 55 minutes or until cake tester comes out clean. Cool for 15 minutes, cut into squares and serve.